Seals and cuts film around trays. 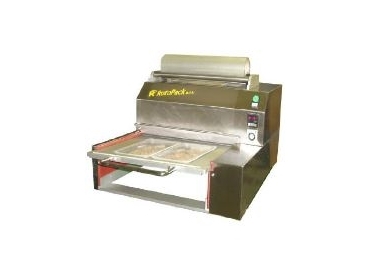 RAPIDA is a semi-automatic sealing machine for preformed trays built by Italian manufacturer RotoPack SRL. The machine seals and cuts film around trays by way of a pneumatic piston; temperature and sealing time are adjustable to seal different kind of films. Available from Heat and Control , the machine is equipped with a safety switch for the correct mould positioning to avoid any possible damage to the knife assembly. Rapida's are also equipped as standard with an external filter to protect the pneumatic equipment. Different sized and shaped trays can be accommodated for with a simple change of the mould and cutting die. With maximum tray dimensions of 350mm x 265mm x150mm and a film width of 400mm, the Rapida tray sealing machine is able to suit a wide range of applications.